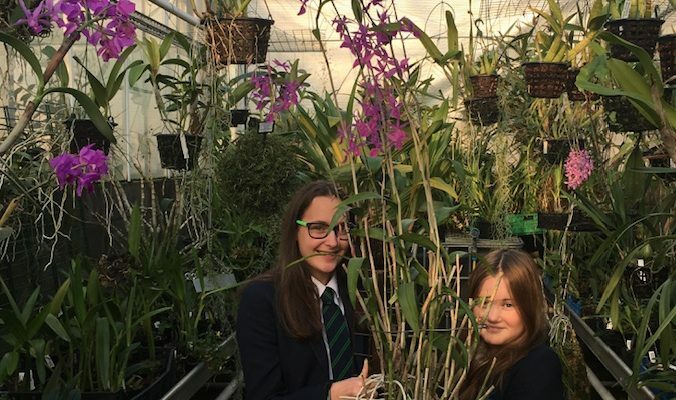 The Writhlington School Orchid Project has been named as one of thirty one botanical institutions worldwide that will be linked for a major new initiative on global orchid conservation. The initiative is lead by the Koo Botanic Conservation Centre Taiwan and students at Writhlington and Mendip Studio Schools will be working alongside international botanists to catalogue the worlds ex-situ conservation collections and co-ordinate conservation projects. Students will be celebrating the start of the initiative at their annual public ‘Orchid Christmas’ on Wednesday 12th December from 6pm to 9pm with mince pies, mulled wine and tours of the famous orchid collection and orchid sales in time for Christmas. Students Amalia and Pip preparing for Orchid Christmas in the school greenhouses.